Google maps is a really helpful tool if you travel a lot to places you’ve never really been before. You can adjust the mode depending on your type of travel whether it is on public transportation or if you’re taking your own car. Google maps shows the street as you drive on it as well as landmarks so that you don’t get confused when there are no street names to go by. All in all using Google maps has become an indispensable tool for a lot of people since its first release. Now another option to hit Google maps for motorcycles. Google initially tested out Google maps for motorcycles in India and there was no better place for them to do so. India has the highest motorcycle usage in the world and with the abundance of narrow roads and alleyways in the country, Google has made specific maps only for motorcycle usage. After India it is onto Indonesia, Myanmar, Malaysia, Honk Kong, Thailand, Vietnam and the Philippines for Google maps for motorcycles. What does Google maps for Motorcycles have that other modes of transportations do not have? Google maps for motorcycles takes into account narrow roads and alleyways as well as the normal routes. The idea behind the Google maps for motorcycles doing this is that two wheelers can easily take these routes where otherwise vehicular traffic would not be able to. Since these additional routes are taken into account of, Google maps for motorcycles gives an estimate of the time taken to travel, congestion and the rest with these routes in mind. Another reason to add these routes onto Google maps for motorcycles is that if the normal routes do not really allow for two wheelers, then motorcyclists can automatically take other routes rather than later having to re- route. 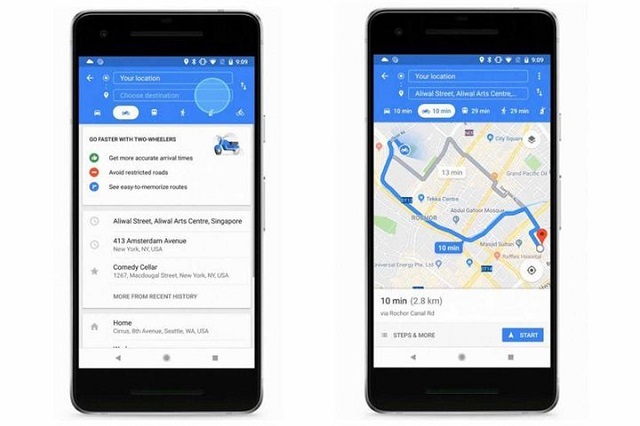 A feature that stands out on Google maps for motorcycles is that the app takes into account landmarks such as hospitals or hotels rather than street names which are difficult to read and maybe even find while one is travelling. The idea is for one to already know where they are going by looking at Google maps for motorcycles before they set out to travel. This will avoid unnecessary looking at the phone while traveling which could cause accidents and serious harm to the traveler or people nearby. Why did Google release Google maps for Motorcycles first in India? Companies go where there is demand and a market. The same happened here too with Google for motorcycles. India has one of the largest markets for two wheeler transportation in the world, hence Google motorcycles in India. In the U.S sales of motorcycles are lagging and that could be one of the reasons why Google looked to Asia for its Google maps for motorcycle testing. While sales in the U.S. lagged, sales in India were increasing driven in part by Government spending on rural road constriction within the country. As of now there is no news whether Google will bring out Google maps for motorcycles in America.